Press releases went out on August 24, 2016 that director Rupert Wyatt (Rise of the Planet of the Apes, The Gambler) would helm Captive State as his next project. The rights went out for bids and after a heated auction, Captive State landed at Participant Media. Participant was apart of Amblin Partners and the picture was distributed in most major markets through the companies that invest into Amblin (Reliance Entertainment, Entertainment One, Alibaba Pictures and Universal Pictures). Universal’s specialty label Focus handled domestic distribution. For all other remaining markets, Lionsgate was tapped to pre-sell the project. 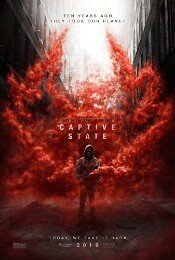 In Jan 2017, Participant inked a sales arrangement with Lionsgate, which would handle up to five of Participant’s features per year and Lionsgate introduced the pre-sale rights to Captive State at the European Film Market in Berlin in February. Captive State was financed by Participant for a modest $25 million and their exposure to the budget was reduced from strong pre-sales. Focus dated the movie for March 15, 2019, where it bowed against Wonder Park and Five Feet Apart. Buzz was very low and Focus basically dumped the picture into the marketplace with little care. Captive State was supported with a small P&A spend (by studio standards anyway), with $6.71M worth of TV ads (as per iSpotTV) and after other advertising and distribution expenses, the domestic P&A costs were about $20M. Focus clearly had little faith in Captive State, which appeared to be no more than a contractual requirement to release the thing and cancelled the critics screenings. Bearing all the signs of a total turkey, tracking was pointing to a dismal $3.5M opening. Surprisingly, the reviews that did post were mixed and not overwhelmingly negative, but Captive State couldn’t even reach the forecasted weekend tally and it was dead on arrival with $3,131,525 — placing #7 for the frame led by the holdover Captain Marvel. Those that showed up gave Captive State a dreadful C- Cinemascore and the picture plummeted 69.4% to $959,165 in its second session and then promptly lost most of its theater count. The domestic run ended after a mere 3 weeks with $5,958,315 — marking one of the shortest theatrical runs for a studio picture. It wasn’t very good, so it makes sense that Focus dumped it. A convoluted mess.